Percussionist, composer, and educator Brian Blume is making himself known nationally and internationally through exceptional skill and creativity. A native of Logansport, Indiana, Brian performs regularly as a soloist, chamber musician, orchestral player, and studio percussionist. His debut album, a Christmas album entitled Let It Snow, released in November, 2012. Brian recently performed at Super Bowl XLVI in Indianapolis, before 112 million viewers worldwide, with Kelly Clarkson, Madonna, and Cee Lo Green, and he was in the 2012 Indianapolis Colts (NFL) Drumline. Brian has teamed up with percussionist Colin Hill to form the BluHill Percussion Duo, which has performed in several states and continues to expand its reach and repertoire. 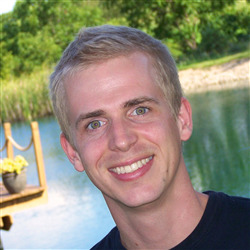 Brian is currently serving as Instructor of Percussion at Southeastern University in Lakeland, Florida, where he teaches applied percussion & drum set, percussion techniques, music theory, and the new SEU Drumline. Prior to his appointment at SEU, Brian taught percussion at Center Grove High School (Greenwood, IN), whose percussion ensembles earned invitations to perform at the Midwest Clinic and PASIC, and earned a bronze medal at the WGI World Championships, all within one year. Brian has also taught several drum corps and the Indiana University Drumline. As a composer, Brian has received numerous commissions and has works published by Tapspace Publications, PercMaster Publications, and drop6 media. His work for TV broadcast has been aired nationwide on ESPN, CBS, Big Ten Network, and MTV. Brian earned both Master and Bachelor of Music degrees in percussion performance from Indiana University’s Jacobs School of Music. He endorses Pearl/Adams instruments, Innovative Percussion sticks and mallets, and he is a member of the Percussive Arts Society (PAS) and the American Society of Composers, Authors, and Publishers (ASCAP). Brian lives in Lakeland with his wife, Sarah. For more, visit www.brianblumemusic.com and follow him on Twitter (@briancblume).